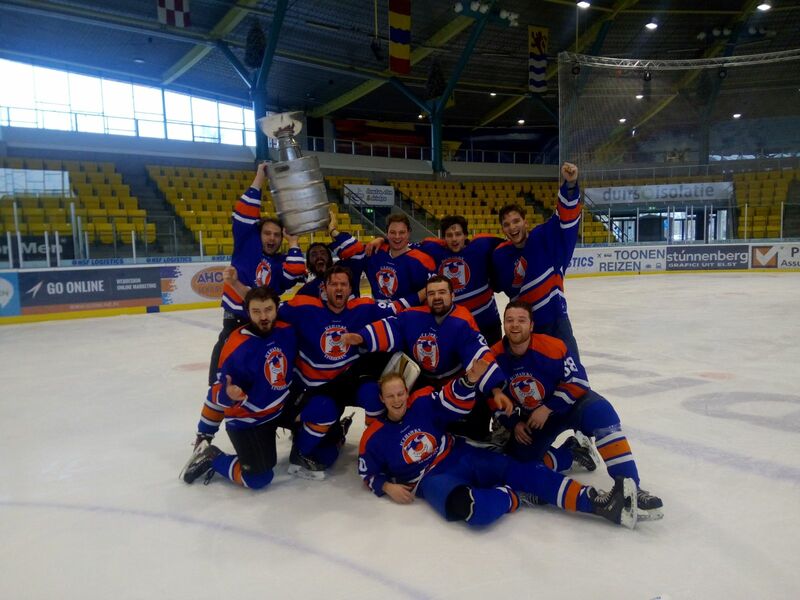 Yesterday the first team of the Icehawks won against the runner-up in the student division Groningen Bulldogs, beating them 6-0. With one match to go, the Icehawks have secured their third championship in a row and fourth championship in five years. Next Friday we will play our last away game of this season against Amsterdam Thor. In the off-season we will have a lot to look forward to: organizing both the NSK-tournament in Eindhoven and Roger’s anniversary tournament. This year, on the 15 and 16 June 2019, we will host the NSK 2019. All student teams can enter in this competition. We have added a new page to our webiste where all relevant info can be found. The Icehawks already welcomed some new members from abroad, who will play for the first team in National Student League. Thurday 20th of September the new rookies will have their introduction practice. For more info look here. More friendly matches for the second team will be announced soon. Check our Facebook event calendar for more details. This year the NSK tournament is coming to Eindhoven. The student teams will battle for this huge trophy during a weekend of hockey-filled binge drinking. We will also organize a 1 day tournament to celebrate the birthday of our coach Roger Provencher, who turns 60 in March. We will invite all the ex-players of the Icehawks to join us in the celebrations. The Juan Carcelén cup will also be organized. Keep a look out on our website for more details. The dates for these tournaments will be announced later. Wow, what an amazing season it’s been for the Icehawks. Champions with 1 game left to play against the Bulldogs from Groningen. Groningen has always been a tough opponent for us, they tend to bring their strongest line-up with some more experienced players from the other Dutch divisions. Ever since the first title for the Icehawks was claimed back in 2010-2011 season, the Bulldogs always finished in a close second place. Making this a rivalry one to watch for the years to come. (*)Slapping Studs forfeited the game. In his 3rd season as an Icehawk, our French center, Guillaume Pellegrin finished with 37 points, 17 goals and 20 assists. For his first season, the Canadian, Brett Speed finished with 31 points, 18 goals and 13 assists. Also in his 3rd season, the Dutch, Bart van Dijk finished with 26 points, 12 goals and 14 assists. (*) 3 games are missing, stats will be updated! Some of you might have already seen the videos of the celebrations on our Facebook page, most of our team was there to join in the festivities. For our foreign players whom already departed to their next destination, we’d like to thank them for joining us and wish them the best of luck in their new ice hockey adventures. This also goes for the players of our second team. Speaking of the second team; they’ve had a rough road behind them playing three different teams from Joe Bar, friendly games against the Leiden Blues and Tilburg Towers. Let’s take a look at the current standings in their own Joe Bar Cup. 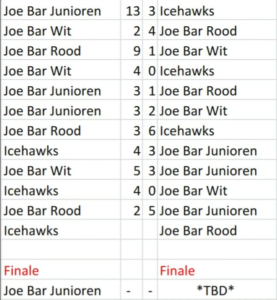 This weekend is the decider match if Joe Bar Rood or the Hawks will be in the finals against Joe Bar Junioren! Puck drops at 21.00 on Sunday the 11th of March. Our beloved coach Roger Provencher got featured in an amazing article written by Cursor TU/e. (Both Eng and NL versions here: https://www.cursor.tue.nl/en/news/2018/maart/week-1/the-ice-hockey-coach-and-mailman-who-brings-a-smile-to-every-face/ ) We couldn’t be more thankfull for our coach. I’m sure that all the Icehawks, both present and past, can agree that Roger never gives up. This is evident in the results from our second team whom have shown an enormous amount of progress. Going from a 13-3 defeat to a 4-3 victory against the same team! 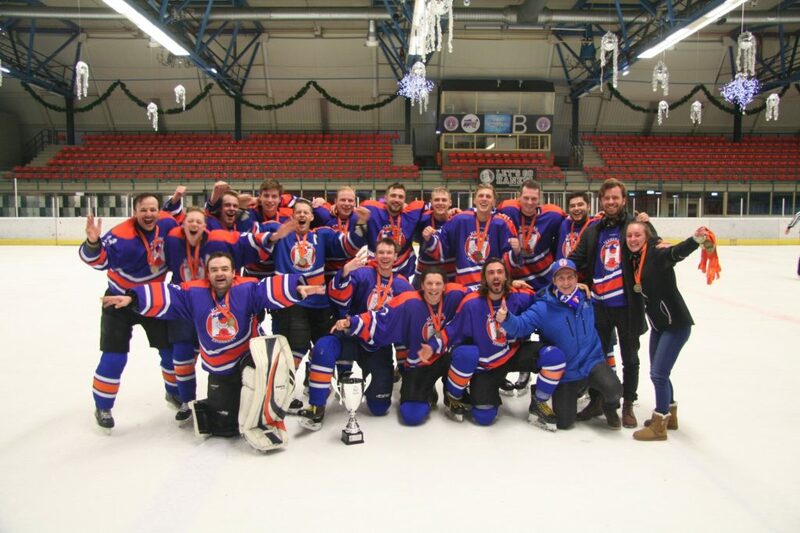 Our captain Ian Coumans mentioned this in the article by Ijshockey Nederland “De ontwikkeling van sommige spelers binnen de club is ongelofelijk. Dat onderscheidt ons van ieder andere club.” (The development of some of our players within the club is incredible. This separates us from any other club). Having had the pleasure of Roger as an ice hockey coach he’s not only helped the future generation of Dutch ice hockey (Kemphanen U12-U16), but also improve the mentality of so many teammates who’ve been part of the Icehawks. He’s a living legend among anyone who’s been part of the ice hockey scene in Eindhoven. Just mentioning his name still brings a smile on the face of anybody who’s played with him during his pro career with the Kemphanen or even has the pleasure of having him as a coach during their youth. On April 3rd 2014 Juan Enrique López Carcelén passed away at the age of 24. To remember him, the Icehawks have decided to name their annual tournament after him. Juan joined our team in 2011 and was one of our best, most enthusiastic, most warm and friendly, players. Keep an eye on the page for more updates! Will the Icehawks manage to secure another title next season? We’ll have to wait and see. In the meantime, there’s still some games to be played. The NSK is just around the corner, our own tournament, the Joe Bar Cup finals, etc. Keep an eye our on our web page and Facebook page, we’ll keep you updated with the results! 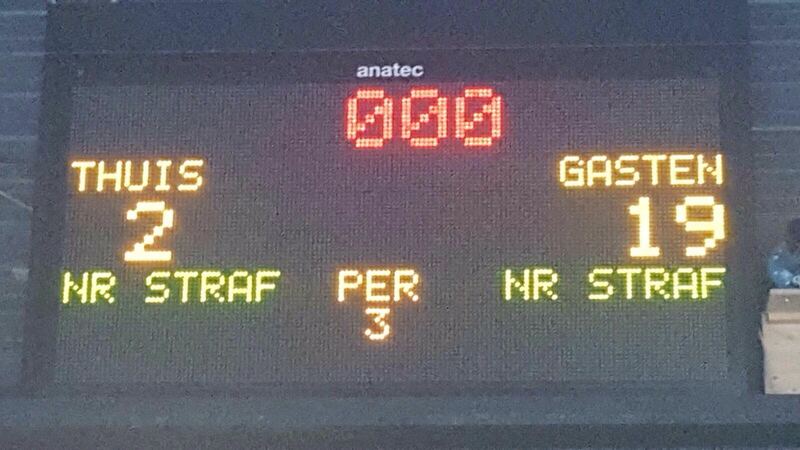 Another 4 points for the first team, and a friendly game from the second team! The first team of the Icehawks stays on top with two wins. 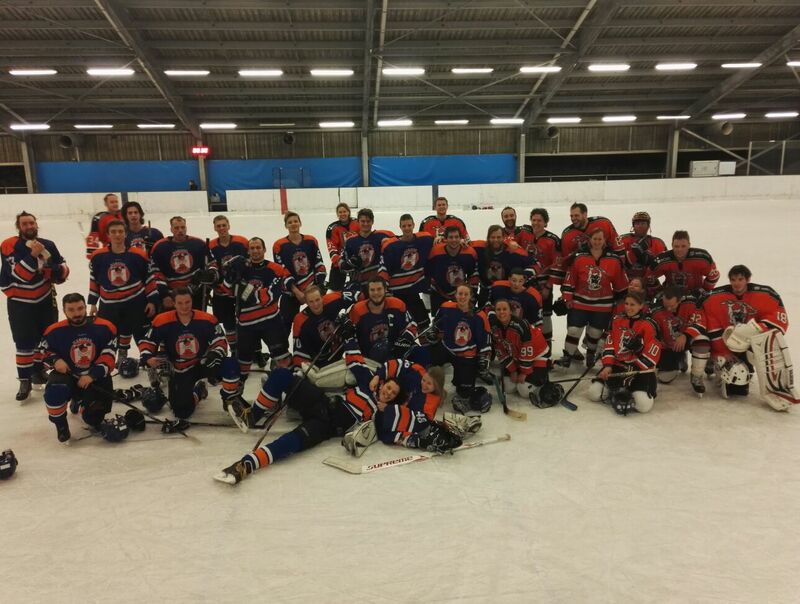 The second team played a friendly match against Joe Bar White in Eindhoven. They played really well with some rookies gaining their first match experience. Although they played well the game ended in a 0-4 loss. After two speedy goals by Brett Speed in the first period and another one in the last minute to complete his hattrick, the Icehawks were destined to win this game. 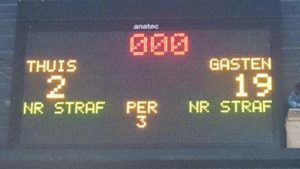 The flow changed in the second period, just like the game against Amsterdam, when the Buccaneers scored two goals without repercussion. The Icehawks regained their play in the last period scoring two times but received a goal as well, ending the score 3-5 and 2 points in the pocket for the Icehawks. A hard fought win for the Icehawks. The Icehawks went on a rampage this weekend and obliterated the Firebirds with an impressive 19-2 win. The first 10 minutes of the game the Hawks had some resistance when the score was 2-1. But soon after that 3 more goals were scored, followed by two periods of 14 goals for the icehawks and 1 against. This big win has resulted in four Icehawks players in the top 5 players with the most points in the league! Season start: straight to the top! This autumn has been a good one for sports in Eindhoven; The Kemphanen are doing great, PSV is doing great and of course the Icehawks are doing great as well! The Icehawks are welcoming a lot of new players this year, 17 in total. We are happy to expand our diversity in the team with some new players from Latvia, Cyprus, Canada and many other countries. This being said, the Icehawks have reached their limit for this season regarding unexperienced players, for more info check the page ‘want to join?’. The Icehawks have played their first two games of the season and have won both! this means we’re the only team in the league that hasn’t lost a game so far. Game reports after the Read More. Next game is next week, also our first home game of the season against Utrecht Buccaneers. The game will be played on the outside rink and starts at 21:00, so bring your thermos! 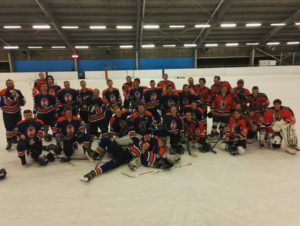 The Icehawks have been invited for an exhibition game against the University team “ICE-Emperors” from Aachen (D). They will play in an arena filled with 3000 spectators who are attending the UNI Cup tournament, an amateur hockey tournament and charity event. It’s time for a new season! Hereby the schedule for the 2017-2018 season. Join us for the 2017-2018 season! Big thanks to everybody who showed up for the Green Strip market yesterday. It makes us really happy to see that there’s so much intrest in icehockey! Days: Monday the 2nd of October and Monday the 9th of October. During the tryouts you’ll need: ice hockey skates, ice hockey stick, ice hockey helmet and ice hockey gloves. There can all be borrowed from the rink. The skates will cost 6€. 1. Which day you’d like to join us: 2nd of October or 9th of October. 2. If you need to borrow any of the following: skates, helmet, stick, and/or gloves. 3. If you need to borrow skates, if yes, what size. Make sure to send the email on time (at least 1 day ahead of time) otherwise we can’t arrange skates for you. Most importantly be at the entrance of the rink at 21:15 so that we can start on time! Dagen: Maandag 2 oktober en maandag 9 oktober. Tijdens de tryout heb je nodig; ijshockeyschaatsen, een stick, een helm en ijshockey handschoenen. Deze kan je allemaal lenen bij de ijsbaan. De schaatsen moeten gehuurd worden op de ijsbaan en dit kost niet meer dan €6. Welke datum je mee zou willen doen. Of je materiaal wilt lenen. Of je schaatsen wilt huren en zo ja welke maat je moet hebben. Mocht je schaatsen willen huren, laat dit dan minimaal 1 dag van te voren weten. Als we hier niet op tijd mee zijn dan is de schaatsverhuur gesloten en heb je dus geen schaatsen. Zorg dat je op de gekozen dag om 21:15 bij de ingang van de schaatsbaan bent! Since our game against Den Haag has been moved, the game against Enschede Slapping Studs was the first of 2017. This game was a clash between the number 1 and 2 in the competition, both very strong and packed with national and international talent. First period ended in 5-0, securing a strong lead in the game. After that the match got rougher and a lot of penalties slowed down the play on both ends, resulting in 2-2 in the second and 2-2 in the third period. total score: 9-4 win for the Icehawks. Amsterdam was difficult to beat in the away game, with the Hawks leading by 1 goal at the end of the second period. At first the Icehawks had trouble getting the puck out of the defensive zone, allowing Thor to control the game. Score was opened by a powerplay goal and after 10 minutes the pucks started flying in with goals by our Scandinavian tandem Könönen and Helcl Øverli. After the first period the game really slowed down, due to some injuries on our side, improved goaltending including some big saves by the opponent and a more conservative approach by our coach Roger Provencher to keep our net clean. 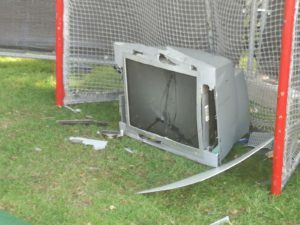 An unfortunate tip-in resulted in an own goal and the last goal of the game. Total score: 6-1 win. With only a few games left to play the Icehawks have set their sights on their third championship.